Retreat to the desert with us to unwind, open your mind and find your bliss with a “Once in a Blue Moon” weekend retreat in Joshua Tree National Park. Join Leslie Honaker from Lauren Brooks Life with Natalie Valle of Love & Alchemy and Kelli Watkins of Bhakti Yoga Seva for a 3-day retreat among the magnificent Joshua Trees! May is the month for living life in full bloom! When we realized there was also going to be a rare full blue flower moon in May, we were inspired to create this blissful gathering in the Mohave desert! We’ve combined rhythms from the ancients, earth and sky to weave an itinerary that will be deep in connecting you with nature to calm the mind, rest your body, and help shed away what no longer serves you. Our home base is a private estate overlooking the Joshua Tree National Park and Yucca Valley. We’ll have plenty of room to sprawl out in this seven bedroom chic desert chateau filled with five star amenities on six acres of land, with access to hiking into the legendary tree covered hills. LEARN MORE and REGISTER by clicking the “VIEW EVENT” button below! Join us for a series of monthly gatherings to plug into a place where bliss reigns, hearts are open and your well-being is numero uno! Imagine stepping into the wide arms of a group that will help you to grow into new places, manifest your dreams and support your journey to loving and caring for your body. Join us Feb 24, Mar 16 and Apr 13. LEARN MORE AND REGISTER by clicking on the “VIEW EVENT” button below! Join me for blissful vibrations at a Sound Bath! This is one of the most ancient forms of healing designed to bring you to a state of deep meditation, relaxation and rejuvenation. Even if you've never meditated before, you can do this . . . all you need to do is lay down and let the vibrations do the work. We’ll be hosting this experience in a special place - where flowers rule and the chicks are cool - Lotus Wei’s new digs in Central Phoenix! Natalie Valle, soundologist from Santa Monica, is our healer working magic on your body. Then, I’m going to nourish you with sips of joyful tea and a nosh of luscious sweet bites from our Sonoran harvest fruit board to awaken your senses after emerging from the heavenly bath. What better time, than the Saturday after Thanksgiving, to set aside 75 minutes to quiet the mind from the food and family frenzy! If you have guests in town, this would be a delightful way to begin your day before brunching, shopping or strolling around some of Phoenix’s treasured sites like the Desert Botanical Garden. $25 per person includes 75 minute sound bath and awakening nosh experience (limited seating - register early!) No refunds for cancellations made 72 hours (3 days) prior to class. Note: Come dressed in comfortable clothes, bring a yoga mat and blanket. We are so lucky to live in the low desert where growing aloe vera yields a big reward for minimal effort. From Cleopatra using it in her beauty rituals to real moms slathering it on to soothe a child’s sunburn, aloe vera takes the place of these queens in the garden as one of the most useful and productive plants to grow. Join us at the potting bench to learn all about aloe! We’re going into the garden to divide The Farm’s mature plants, learn how to propagate pups and send you off with a pot planted up to take an aloe vera queen of your own home! $20 pp includes down-to-earth instruction, handouts as well as a make ‘n take potting experience. Dress to get your hands a wee bit dirty! Join me at the potting bench to learn how to grow paperwhites to decorate your home or holiday table for Christmas. Cheery clusters of small white flowers dancing atop long green stems, Paperwhites, have been a holiday decor tradition in homes for generations and make eco-fun gifts too! You’ll learn about the different bulb varieties and scents as well as how to plant and care for them. You’ll also “make and take” home a festive paperwhite vase of your very own. $20 includes down-to-earth instruction, handouts, resource guide and a planted paperwhite vase. There will be additional bulbs and vases available for you to purchase at our Paper White Pop Up Shop! Are You in a Rut and Tired of the Same Standby Salads? Come to my little haus by the lake to discover a new spin on salads with flavors, combinations and ingredients you may have not tried before. They are healthy, gluten free, packed with vibrant nutrition. Guarantee, they'll quickly be among your new favs to enjoy as you say good bye to the stove and cool down your kitchen for the summer ahead. We’ll make and dine on three of my fav salads: Watercress, Pistachio and Orange Blossom, Grilled Romaine with Corn and Avocado, and Burrata with Stone Fruit, Mint and Chilis. We’ll pair the salads with wine and cocktails for more bliss in our belly! Includes hands-on cooking and instruction, trio of salad supper with beverages, recipes, class playlist, resource guide and technique video. Spring is in the air and summer is just around the corner. It is the perfect time to set out warm season herbs to bring in the bees, anchor your garden, and provide a bounty of sprigs for cooking, crafting and scenting your home. You’ll get the low down on how to organically grow them and learn Leslie’s top 5 favorite spring herbs to plant now. You don’t need to live in Provence or Tuscany to grow the lavender and basil of your dreams. Your new fabulous life surrounded by aromatic herbs can happen right here under the Sonoran Sun! To get you growing - a free herb transplant is included! Includes down-to-earth instruction and handout, soil blend recipes with resource guide and one organic herb transplant. So you want to garden, but don’t have the time, space or desire to invest in a plot in the ground? 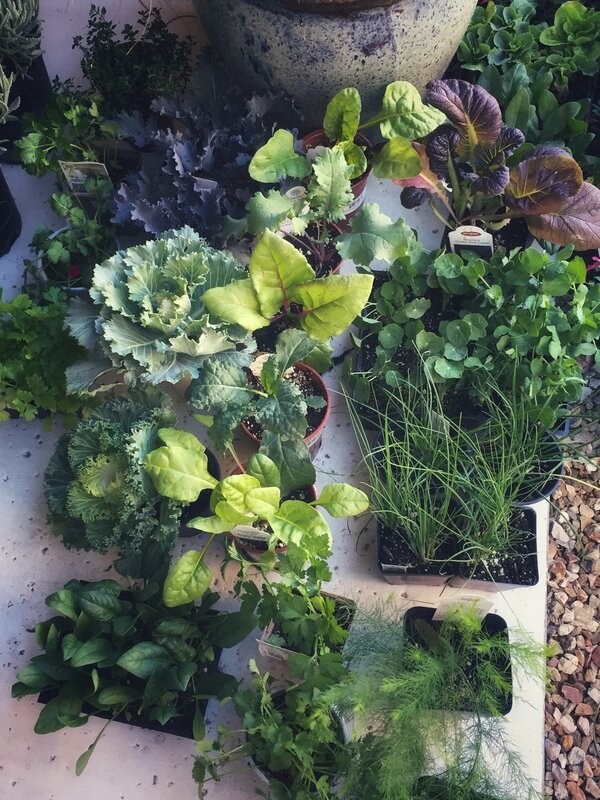 Just look around, I bet you have small spots on a patio, balcony, front door entryway or pool deck to place a pot of aromatic herbs, bonny flowers and vibrant veggies! 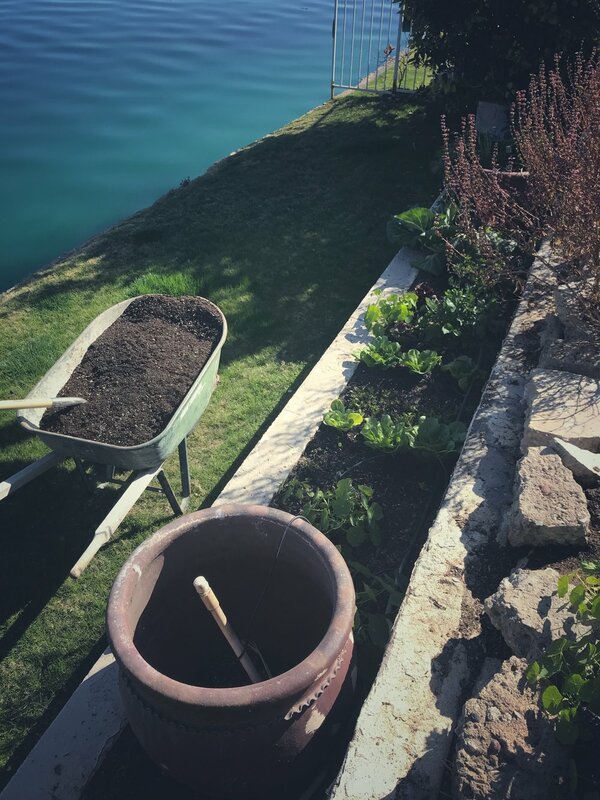 Join me at my little garden by the lake to learn the basics of building nutrient rich organic potting soil then create a petite “moveable feast” in a light weight eco-friendly pot of your own to take home. With themes like Italian Cook’s Companion, Chef-in–Training, Indochine Cuisine, and Herbes de Provence - you’ll be pinching and cooking with herbs soon! Includes down-to-earth instructions with hands-on planting, a petite pot of three herbs, handout with potting soil recipe and resource guide. Just about now, I feel the entire population of Phoenix, running around outside to squeeze in as much time in the mountains, on a lake, at the park or eating dinner under the stars as they can before we shutter up the windows and turn on the air conditioner for summer. While on the go, I still like to eat good food and often make this trio of foodie approved meals for a road trip or lunch by the pool. Come grab the last bits of cool weather at my little haus on the lake to harvest herbs from my garden and learn how to make: Three Cheese, Potato and Rosemary Tarts, Peach, Basil and Tomato Salad with Grilled Chicken and Lavender Shortbread Cookies. You know we are going to eat all of this at the end, right? Includes three course picnic, hands-on cooking instruction with recipes, resource guide, class playlist, technique video and a little something for your picnic basket! So you want to garden, but don’t have the time, space or desire to invest in a plot in the ground? 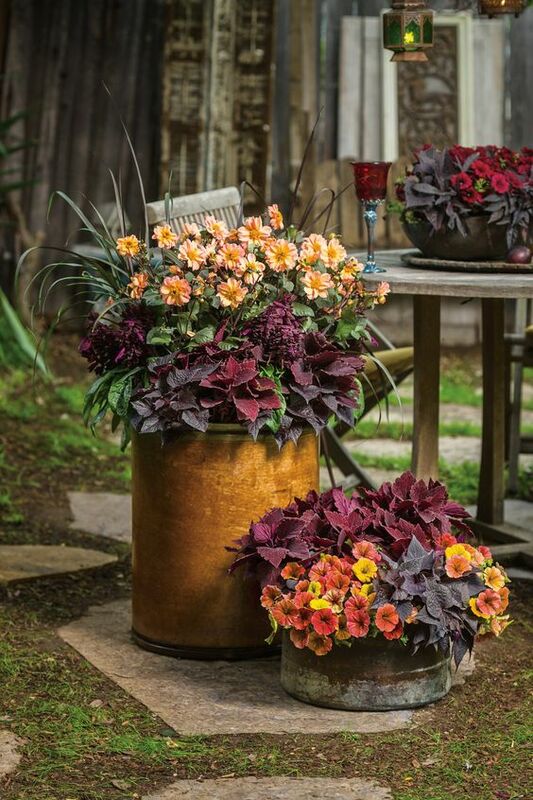 Just look around, I bet you have small spots on a patio, balcony, front door entryway or pool deck to place a pot of aromatic herbs, bonny flowers and vibrant veggies! 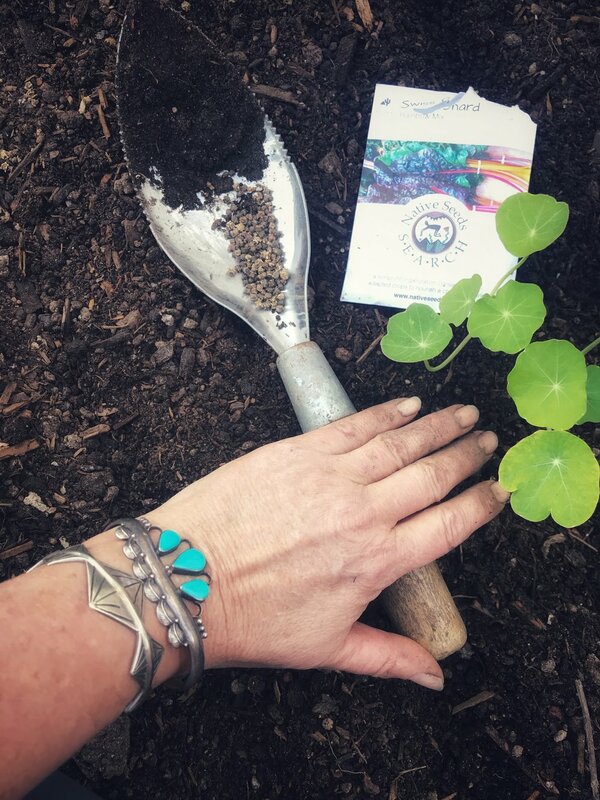 Join me at The Farm at South Mountain to learn the basics of building nutrient rich organic potting soil then create a petite “moveable feast” in a light weight eco-friendly pot of your own to take home. With themes like Italian Cook’s Companion, Chef-in–Training, Indochine Cuisine, and Herbes de Provence - you’ll be pinching and cooking with herbs soon! This is a cooking and gardening class rolled into one! First we’ll start with a short course on Tomatomania where you’ll learn how to grow juicy, delicious, and colorful organic heirloom tomatoes. I’ll answer those vexing questions - to stake or not to stake? determinate or indeterminate? when to plant? what varieties grow best? and much more. Then we’ll head into the kitchen to make and sip on an organic heirloom roasted tomato soup. Get the best tips in town on how to grow tomatoes in the desert then enjoy a cup of soup around the dinner table to chat and ask tomato/gardening questions then leave with a free heirloom tomato transplant and soup recipe! Although they live in the long cold darkness for most of the time, Danes are consistently ranked as some of the happiest people in the world. So what’s their special Scandinavian sauce? Just because we dwell under a searing hot sun, are we doomed from experiencing their hygge happiness? NOPE! As we head into our new year, I’ll teach you how to embrace hygge (hoo – gah) - the ritual of making the ordinary more meaningful and special. Think of it as a manifesto using elements of gratitude, togetherness, simple savored pleasures, nature and comfort on an everyday basis! We’ll be cozied up at my little haus by the lake under the glow of candlelight (one of the primary elements of hygge) and learn how to embrace bliss through this beautiful Nordic lifestyle. You’ll see how to prepare a simple feasting table to welcome family and friends, sample sumptuous Scandinavian home-made comfort food like an organic warming soup, Nordic quinoa salad, and squares of floral infused chocolate bark. We’ll open the conversation to the art of be-ing and you’ll leave with a plan on how to live the hygge life year round! It’s all you need to start making small changes with big results to add bliss and joy into your life. Includes three course dinner, hands-on cooking and instruction, handout and resource guide, class playlist and a special hygge gift. Do you want to dig in to a garden plot of your own, but don’t know where to start? 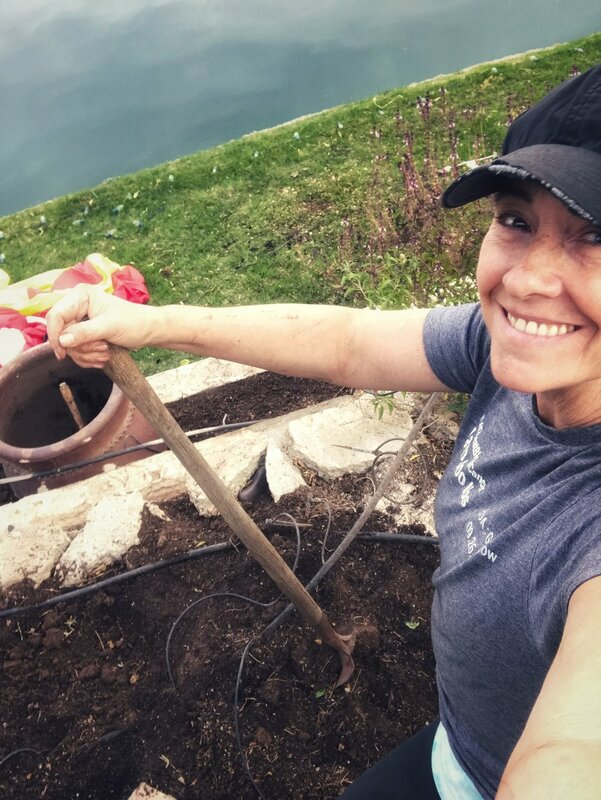 Come expand your field of knowledge about our desert soil, learn how to select season appropriate plants and how to nurture your garden organically. Leslie will put you on a path of success with her tips and tricks, detailed handouts and down-to-earth instructions. To get you fertile in no time - a free 1lb bag of earthworm castings is included! Includes down-to-earth instructions with handout, resource guide and a 1 lb. bag of earthworm castings. Tomato growing success starts here! This is a one-stop adventure in Tomatomania where you’ll learn how to grow juicy, delicious, and colorful organic heirloom tomatoes. Leslie will answer those vexing questions - to stake or not to stake? determinate or indeterminate? when to plant? what varieties grow best? and much more. You’ll meet The Farm’s grower, tour their greenhouse, get the best tips in town on how to grow tomatoes in the desert and leave with a tomato transplant to take home! Includes down-to-earth instructions with handout, resource guide and an heirloom tomato transplant from The Farm’s greenhouse. Crepes by Candlelight: Sweet Bites for Valentine’s Day Night! I’m a Francophile, a lover of all things French. So naturally, crepes are among my favorite things to eat as a savory meal or a sweet treat. My Viking Men (a tough food crowd) love them too! With Valentine’s Day just around the corner and love in the air, it’s the perfect time to make sweet crepes to woo a lover, lavish your family, thank someone special, or keep all to yourself! Come join me in the kitchen at my little haus on the lake to learn how to make classic crepe and gluten free batters then taste them with traditional toppings like beurre sucre avec cannelle (butter, sugar and cinnamon) and confiture de fruit rouges (four berry jam) or with real Italian hazelnut chocolate and bananas. We’ll end the night by gathering around the communal table amid the soft glow of candlelight to top our crepes with fresh vanilla whipped or coconut crème (vegan). Hurry up mon cheries … I’m already craving a crepe right now! Includes hands-on cooking and instruction, coffee and crepe clutch, classic and gluten free crepe recipes, resource list, technique video and class playlist. The minute our two weeks of winter is over, I’m opening the doors and ready for dining outside, al fresco, with family and friends. I am in bliss smelling the herbs in the garden, holding a glass of wine in my hand, a slice of cheese in my mouth and fragrant freesia under my nose! Join Mireille Helm, from Everybody Loves Flowers and me as we kick off our "Bliss Hour' series at her beautiful shop in Barnone at Agritopia in Gilbert. Spring is all about flowers, food and entertaining! 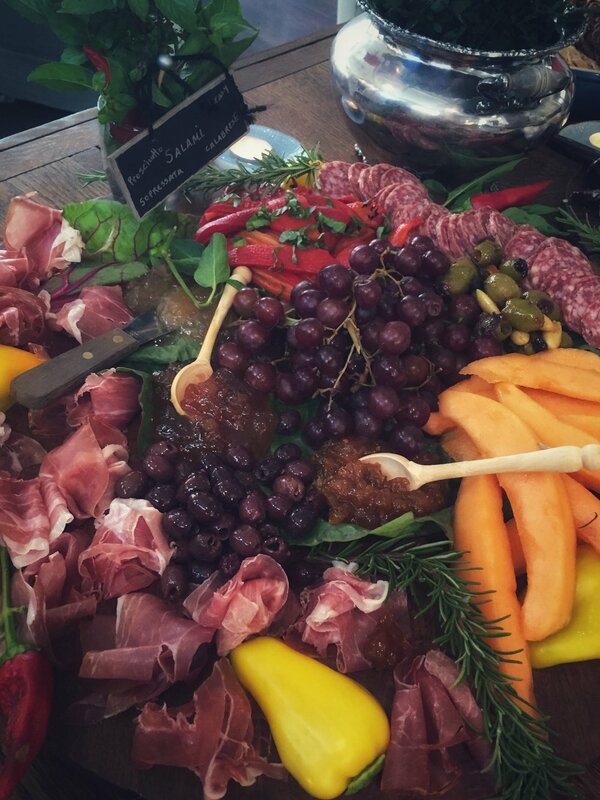 Join Mireille will teach us how to make a sweet and fragrant flower necklace (who needs perfume when you can wear the real deal) then I’ll show you how to make a simple, but killer charcuterie board to wow your guests. We'll feast from the board and grab a wood-fired pizza from Fire and Brimstone to fill your belly with bliss! Bring along your favorite bottle of wine, so we can share and sip to make a wine tasting adventure of our own. Come early to visit The Farmer's Market (5-8 pm) or stroll through Agritopia’s gardens to power down and get ready to step into the Bliss Hour ahead! 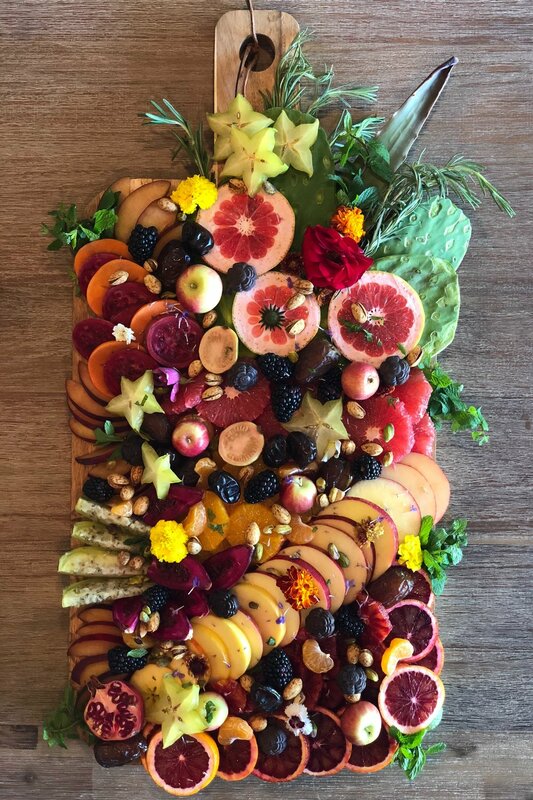 Includes flower necklace supplies and hands-on instruction, charcuterie board making with eating, ingredient and resource guide, technique video and class playlist.